If you ask me what is my biggest challenge in life, then I would humbly say ‘managing time’. I am also sure that you are going to hear the same answer from many working people. From work to family, there are numerous things that need to be taken care of. But suppose in this fast-paced life you are provided a customized service that delivers all your mundane things. We can see the smile coming. Well, AaramShop is a social commerce portal that lets you do aaram and takes care of your mundane essentials through Facebook. So next time, while you are chatting with your friends on Facebook and your wife pulls out a list, then let AaramShop do the job for you. AaramShop, being a social commerce business has maintained an amazing presence. It’s not just the presence but it’s trying to connect and build relationships with its fans. That’s something very likeable. Blog: Businesses maintaining a regular blog is a must and also shows their seriousness about connecting with fans. Maintaining a blog is not easy and it needs continuous efforts; AaramShop blogs in its style ‘aaram sey‘ (in leisure). A regularly updated blog. It is not an easy job but AaramShop is doing great work here. Clear objective with great content is the highlight of the blog. Along with the above great things, AaramShop can still do with some more work on the blog. Can choose a different template. The current template makes it difficult to read. Align your social presence at one place and display on the top so that it is visible to readers. Define categories so that it is easy for the readers to look for content. Use a third party commenting system. This will help you to get more readers on your blog when you share comments on social networks via third party commenting system. Finally content is great but make a point to connect with your fans and get feedback on it. This is quite helpful and gives them a reason to read your blog. Why not write some guest post on Indian blogs. This will help people recognize you online. 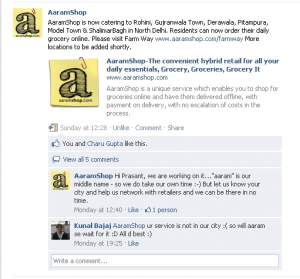 Facebook: Aaramshop has an amazing presence with six hundred plus fans. 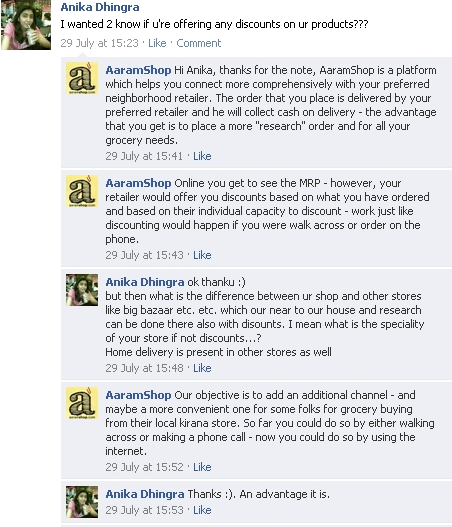 AaramShop is not only connecting but it is also engaging with its fans on Facebook. Info section well covered and elaborated so that fans get the required information. Content is regular and brilliant like this one. It is also providing great content that will be helpful for fans and it is being liked by fans which we can see in this thread. AaramShop is also providing right information that fans are looking for as we can find here. Very smartly handled the situation and made the fan happy, turning him to a potential customer. Facebook presence is really amazing, that is visible if you look on the wall. Aaramshop can work on some simple things and make the fan page awesome. Get a landing page or welcome page and work on the display picture. You can have a look at this post to find out how display pictures have been used. Add videos to make your fans understand how Aaramshop works and why are you providing the service. Visuals effects work more than words. Start interacting more with fans, make a weekly content plan, make them feel special to be a part of the community and measure your engagement on Facebook. Twitter: AaramShop has not left the 140 characters and has made a decent community of one hundred and thirty followers. Smartly used the background image with its brand logo. Twitter needs more active presence and Aaramshop is meeting that expectation. Aaramshop is sharing great content on Twitter too. Though Aaramshop is genuinely trying to build a Twitter community but there are small areas of improvement. Connect with likeminded people and build your network. Use Twellow, Wefollow, etc. apps. Engagement with the community is missing. Talk to your community as Twitter is a social place. Sharing links is great but Twitter is not an information sharing network alone. Share helpful content of others that will be helpful for your community. Measure your performance on Twitter. Klout is great to start with but try Twoolr too. Gives a lot of useful analytical information that is helpful. LinkedIn: AaramShop has a LinkedIn presence and a nice company page. The community is new and has a decent company page. Getting recommendation about your service will really help people know about it. Great to see tweets and blog integrated with the company page. 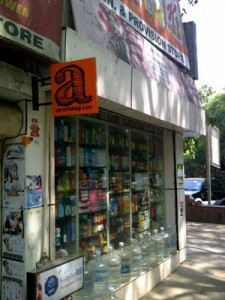 AaramShop is a brand that has adopted social media with a clear objective of brand awareness and reaching out to people. Glad to say that the efforts from AaramShop are genuine and wish them growth.